P2Y2, Bone marrow cells, Mechanotransduction, Oscillatory perfusion. Oscillatory fluid flow, one of the key mechanical stimuli in bone tissue, is a potent stimulator to bone cell activities [1-3]. It can initiate a series of intracellular signaling pathways, such as calcium mobilization, COX-2 protein up regulation and ERK1/2 phosphorylation [1,4-6]. While oscillatory fluid flow has been used as a standard mechanical stimulation to study bone cell mechanobiology, experiments were mainly performed in traditional monolayer cell culture systems. In reality, however, bone tissue is a three-dimensional (3D) structure by itself, which has its own implications in bone cell activities and tissue development. Thus, our long-term goal is to systematically study bone cell mechanobiology in 3D systems. Combining oscillatory fluid flow and 3D cell culture environment, we built an oscillatory perfusion bioreactor for this purpose. We have previously demonstrated that P2Y2 purinergic receptors are involved in osteoblast mechanotransduction . Riddle et al. showed that flow-induced ATP is able to regulate human bone marrow cell metabolism . Thus, ATP may also affect bone marrow cell mechanobiology through P2Y2 receptors. Additionally, Bagchi et al. have reported that P2Y receptors interact with actin-binding proteins (filamin A) and integrins which are widely believed to play an important role in cell mechanotransduction and adhesion, suggesting that mechanical force may activate P2Y receptors through integrin’s [9,10]. Furthermore, P2Y2 has been reported to play an important role in cell migration . Taken together, these results suggest a pivotal role of P2Y receptors in cell mechanotransduction. Thus, we hypothesize that the P2Y2 purinergic signaling pathway, activated by ATP release due to mechanical stimulation, is essential to regulation of bone marrow cell responses to oscillatory perfusion. In the present research, we used a self-built oscillatory bioreactor to investigate the role of P2Y2 purinergic receptors in bone marrow cell mechanobiology. Bone marrow cells from both wild type (WT) mice and P2Y2 knockout (KO) mice were seeded in polylactide acid (PLA) scaffolds and then subjected to oscillatory perfusion. We examined ERK1/2 phosphorylation, ATP release, alkaline phosphatase (AP) activity and calcium deposition rate as well as mechanical properties of cell-scaffold constructs. Oscillatory perfusion bioreactor was designed based on the previous 2D flow chamber system . Polylactic acid (PLA) scaffold was fabricated using salt leeching method with NaCl particles (300-500 μm). The volume ratio of PLA and NaCl is 1:9 to create 90% porosity scaffold. Scaffold was cut into cylinders (5 mm in diameter and height) for experimental use. Cell culture media was pumped through the scaffold in an oscillatory pattern (1 Hz frequency) using a Harvard syringe pump system. The maximum volume is 65 ml/s. Mice at age of 8 to 10 weeks were sacrificed, and bone marrow cells were flushed out from femurs and tibias with a syringe needle system using cell growth medium (αMEM with 15% FBS, 50 μg/ml L-Ascorbic Acid, 1% P/S). Subsequently, cells were seeded into the PLA scaffold in a density of 100 × 106/ cm3. At day 7, cell-scaffold was rinsed with cell culture medium to remove floating cells, and then cultured in cell differentiation medium (cell growth medium, 10 nM Dexamethasone, 10 mM Beta-Glycerol-phosphate) for 7 or 21 d. Then the cell-scaffold constructs were used for the mechanical stimulation experiments. To examine the effects of oscillatory perfusion on ERK1/2 phosphorylation, marrow cells were exposed to perfusion. After experiments, scaffolds with cells were stored in -80oC freezer. Cells were later lysed with RIPA buffer and total protein concentrations were determined by bicinchoninic acid assay (Pierce). Twenty-five micrograms of total protein from each sample was separated by SDS–PAGE and transferred to PVDF membranes. Membranes were incubated with P-ERK1/2 or ERK1/2 primary antibody overnight at 4°C, and subsequently with the secondary antibody for 1 h. Visualization of immuno reactive proteins was achieved by employing an ECL detection system and membrane exposure to film. For AP activity, scaffolds with cells was washed twice with PBS and incubated for 30 min in 0.5 ml of 0.75 M 2-amino-2- methyl-1-propanol, pH 10.3, containing 2 mg/ml p-nitro phenyl phosphate substrate. The reaction solution was mixed with an equal volume of 50 mM NaOH and then diluted 1:40 with 20 mM NaOH. Absorption was measured at 410 nm, and conversion to enzyme activity was made with a p-nitro phenol standard absorption curve. To quantify calcium, the ocresolphthalein method was used following manufacturer’s instruction from the calcium assay kit (Cayman Chemicals). During oscillatory fluid flow experiments, conditioned media were collected and frozen in -80°C freezer for analysis. ATP concentration in samples of conditioned media was determined using a commercially available ATP bioluminescence assay kit (Roche) according to manufacturer’s protocol. Results were normalized to cellular protein concentration using bicinchoninic acid assay (Pierce). All data were analysed with Graph Pad Prism software (Graph Pad Software, La Jolla, CA). Data are expressed as mean ± standard error. To compare observations from two groups, twosample student’s t-test was employed. A value of p<0.05 was considered statistically significant. After cultured for 7 d then seeded in PLA scaffold for another 7 d, marrow cells from WT and P2Y2 mice were exposed to oscillatory perfusion for 5, 15 and 30 min respectively. Western blot analysis revealed that oscillatory perfusion was able to stimulate ERK1/2 phosphorylation, which was significantly (30%) greater in WT cells compared to P2Y2 KO cells (Figure 1). The result suggests that P2Y2 receptors are positively involved bone marrow cell responses to mechanical stimulation. Figure 1: Bone marrow cell response to oscillatory perfusion in terms of ERK1/2 phosphorylation. Left: western blot analysis of ERK1/2 phosphorylation in primary bone marrow cells. Right: Bar graph representation of ERK1/2 phosphorylation quantified by scanning densitometry normalized to total ERK1/2. Each bar represents SEM (n=6, *p<0.05). To further investigate the role of P2Y2 in bone mechanotransduction, we examined ATP releases from bone marrow cells from WT and P2Y2 KO mice exposed to perfusion. ATP release from WT and P2Y2 KO cells was not statistically different at the first min when the highest ATP concentration was measured (9.71 ± 4.46 nM and 9.16 ± 4.15 nM respectively as shown in Figure 2. Figure 2: ATP concentration in conditioning medium collected after 1 min of oscillatory perfusion when ATP concentration is the highest. Each bar represents SEM (n=6). Mechanical properties are important to engineered tissue. After 28 d in culture, we examined the instant modulus and longterm modulus of cell-scaffold constructs using stress relaxation test with a constant strain of 10%. Instant modulus was measured immediately after loading, while long-term modulus was measured after 30 min when the number is stable. We found that both moduli were significantly increased about 50% compared with control scaffolds (Figure 3). In addition, moduli of scaffolds with WT bone marrow cells were slightly higher than those with P2Y2 KO bone marrow cells. Figure 3: Instant and Long-term moduli of cell-scaffold constructs measured with stress relaxation test. Control samples are PLA scaffold without cells. Each bar represents SEM (n=6, *p<0.05). AP activity and calcium content in the cell-scaffold constructs were also examined to determine the differentiation and mineralization of bone marrow cells. After 28 d in culture, we found that both differentiation and mineralization increased greatly in all scaffolds. But those of scaffolds with P2Y2 KO cells are significantly less than those of scaffolds with WT cells (Figure 4). During this process, we also measured total protein concentrations in each piece of scaffold. We found that total protein concentrations from scaffolds of WT cells were significantly higher than those from P2Y2 KO cells at 28 d (2742 μg/scaffold vs. 1993 μg/scaffold on average), which implies that P2Y2 KO cells may have a lower proliferation rate. 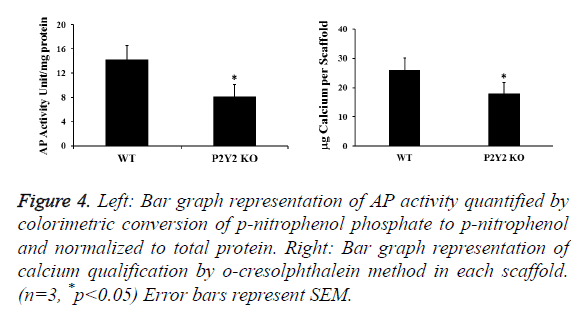 Figure 4: Left: Bar graph representation of AP activity quantified by colorimetric conversion of p-nitrophenol phosphate to p-nitrophenol and normalized to total protein. Right: Bar graph representation of calcium qualification by o-cresolphthalein method in each scaffold. (n=3, *p<0.05) Error bars represent SEM. Oscillatory fluid flow has been demonstrated to be a strong stimulator to bone growth and remodeling. It plays an important role in bone cell proliferation, differentiation, and extracellular matrix production [1-3]. While oscillatory fluid flow has been used as a standard mechanical stimulation to study bone cell mechanotransduction, experiments were mainly performed in traditional monolayer cell culture systems. In reality, however, bone tissue is a 3D structure by itself, which has its own implications in bone cell growth, differentiation, signal transduction, and tissue development [13-16]. A new research thrust in recent years has been the 3D scaffold for cell culture and tissue engineering, and one of our research interests has been to understand the effect of oscillatory fluid flow on bone cells. So, we developed an oscillatory perfusion bioreactor to study cell mechanotransduction and tissue engineering. PLA was chosen as the scaffold material because of its well-known biocompatibility. Additionally, it is relatively soft so a small increase in scaffold modulus may be detected. Our results showed that P2Y2 receptors are one of the major contributors to bone marrow cell mechanotransduction through ERK1/2 pathways. We found that perfusion-induced ATP release from WT or P2Y2 KO osteoblastic cells was the same, strongly suggesting that the effects observed in this study are directly due to the lack of P2Y2 receptor, instead of ATP release. Our previous studies demonstrated that membrane structural components related to lipid rafts, cholesterol and GPI-anchored proteins may play an important role in mechanically induced ATP releases in osteoblastic cells . Thus, our results suggest that P2Y2 receptors may not be involved in mechanically induced ATP releases, but involved in subsequent responses after released ATP stimulation. We used primary bone marrow cells for our studies. The increased instant and long-term moduli of cell-scaffold constructs suggest that bone marrow cells are able to produce extracellular matrix to enhance the structure of the scaffold. Although increased cell numbers may also contribute to the upregulation of scaffold modulus, it is generally neglected because modulus of cells (2-10 kPa) is much smaller than modulus of scaffold . The measured moduli are much smaller than the elastic modulus of real bone structure because the elastic modulus of PLA is small, and the scaffold also has 90% of porosity. But our aim is to examine the possibility of using the perfusion bioreactor and bone marrow cells for tissue engineering instead of making a functional bone tissue. HA/ βTCP will also be used to fabricate scaffolds in our future studies. Additionally, scaffolds with P2Y2 KO cells have smaller moduli than those with WT cells, and they also have decreased AP activity and calcium deposition rate. These results are consistent with each other. The decreased mineralization rate in P2Y2 knockout cells may result in smaller elastic moduli of the scaffold. Together, these results suggest that P2Y2 is involved in cell osteogenic differentiation. According to some earlier studies, P2Y2 receptors also play an important role in differentiation of several other cell types, including neurons . Our in vitro results of differentiation and mineralization were in contrast to what Orriss et al. have previously reported . This may be due to the different cells used in their study, in which rat primary calvarial osteoblasts were treated with ATP or UTP. In conclusion, we have built a functional oscillatory perfusion bioreactor, which can be used for cell mechanobiology and tissue engineering studies. Additionally, primary bone marrow cells were able to differentiate toward osteoblasts in proper conditions, and can be a suitable cell source for bone tissue engineering studies. We also found that P2Y2 purinergic receptors are involved in bone marrow cell mechanotransduction as well as in their differentiation and mineralization. The results suggest P2Y2 plays an important role in bone tissue development. Research was supported by the National Institutes of Health of USA (Grant# AR054851 awarded to Jun You) and the National Natural Science Foundation of China (Grant# 11672078 awarded to Yanghui Xing). You J, Jacobs CR, Steinberg TH, Donahue HJ. P2Y purinoceptors are responsible for oscillatory fluid flow-induced intracellular calcium mobilization in osteoblastic cells. J Biol Chem 2002; 277: 48724-48729. Ponik SM, Triplett JW, Pavalko FM. Osteoblasts and osteocytes respond differently to oscillatory and unidirectional fluid flow profiles. J Cell Biochem 2007; 100: 794-807. Jaasma MJ, O'Brien FJ. Mechanical stimulation of osteoblasts using steady and dynamic fluid flow. Tissue Eng 2008; 14: 1213-1223. Wadhwa S, Godwin SL, Peterson DR, Epstein MA, Raisz LG. Fluid flow induction of cyclo-oxygenase 2 gene expression in osteoblasts is dependent on an extracellular signal-regulated kinase signaling pathway. J Bone Miner Res 2002; 17: 266-274. Okumura H, Shiba D, Kubo T, Yokoyama T. P2X7 receptor as sensitive flow sensor for ERK activation in osteoblasts. Biochem Biophys Res Commun 2008; 372: 486-490. Genetos DC, Kephart CJ, Zhang Y, Yellowley CE, Donahue HJ. Oscillating fluid flow activation of gap junction hemi-channels induces atp release from MLO-Y4 osteocytes. J Cell Physiol 2007; 212: 207-214. Xing Y, Gu Y, Bresnahan JJ, Paul EM, Donahue HJ, You J. The roles of P2Y2 purinergic receptors in osteoblasts and mechanotransduction. PLoS One 2014; 9: e108417. Riddle RC, Taylor AF, Rogers JR, Donahue HJ. ATP release mediates fluid flow-induced proliferation of human bone marrow stromal cells. J Bone Miner Res 2007; 22: 589-600. Bagchi S, Liao Z, Gonzalez FA, Chorna NE, Seye CI. The P2Y2 nucleotide receptor interacts with alphav integrins to activate go and induce cell migration. J Biol Chem 2005; 280: 39050-39057. Yu N, Erb L, Shivaji R, Weisman GA, Seye CI. Binding of the P2Y2 nucleotide receptor to filamin A regulates migration of vascular smooth muscle cells. Circ Res 2008; 102: 581-588. Chen Y, Corriden R, Inoue Y, Yip L, Hashiguchi N. ATP release guides neutrophil chemotaxis via P2Y2 and A3 receptors. Science 2006; 314: 1792-1795. Jacobs CR, Yellowley CE, Davis BR, Zhou Z, Cimbala JM, Donahue HJ. Differential effect of steady versus oscillating flow on bone cells. J Biomech 1998; 31: 969-976. Rasheena E. Three-dimensional cell culture systems and their applications in drug discovery and cell-based biosensors. Assay Drug Dev Technol 2014; 12: 207–218. Qiaoling S. Ex vivo 3D osteocyte network construction with primary murine bone cells. Bone Res 2015. Jenkins J, Dmitriev RI, Morten K, McDermott KW, Papkovsky DB. Oxygen-sensing scaffolds for 3-dimensional cell and tissue culture. Acta Biomater 2015 16: 126-35. Knight E, Przyborski S. Advances in 3D cell culture technologies enabling tissue-like structures to be created in vitro. J Anat 2014. Xing Y, Gu Y, Xu LC, Siedlecki CA, Donahue HJ, You J. Effects of membrane cholesterol depletion and GPI-anchored protein reduction on osteoblastic mechanotransduction. J Cell Physiol 2011; 226: 2350-2359. Nataliia G. If cell mechanics can be described by elastic modulus: study of different models and probes used in indentation experiments. Biophys J 2014; 107: 564–575. Glaser T, Resende RR, Ulrich H. Implications of purinergic receptor-mediated intracellular calcium transients in neural differentiation. Cell Commun Signal 2013; 11: 12. Orriss IR, Knight GE, Ranasinghe S, Burnstock G, Arnett TR. Osteoblast responses to nucleotides increase during differentiation. Bone 2006; 39: 300-309.